Stitched together using a double strand of sock weight yarn to create a lovely color way and a bit of cushion while staying light. The yarn is a 75% wool and 25% nylon blend which gives it a rustic look and feel with a little stretch. I made it directly against one of my own decks to make it fit snuggly whether you choose to store your cards in their box or not. The top curves in to help hold your cards for traveling with. Many bags I have used are loose and my cards end up sliding across the floor of my car or spilled in my purse. So I really worked hard to make it snug but not too snug! Perfect for readers who take their cards with them everywhere. The box used to measure the bag is shown in pictures as an example. The box itself measures 2.5 x 1 x 3.8 inches with the bag being just big enough to fit over it. Would fit most standard Lo Scarabeo decks. This listing DOES NOT include the props, tarot deck, etc. 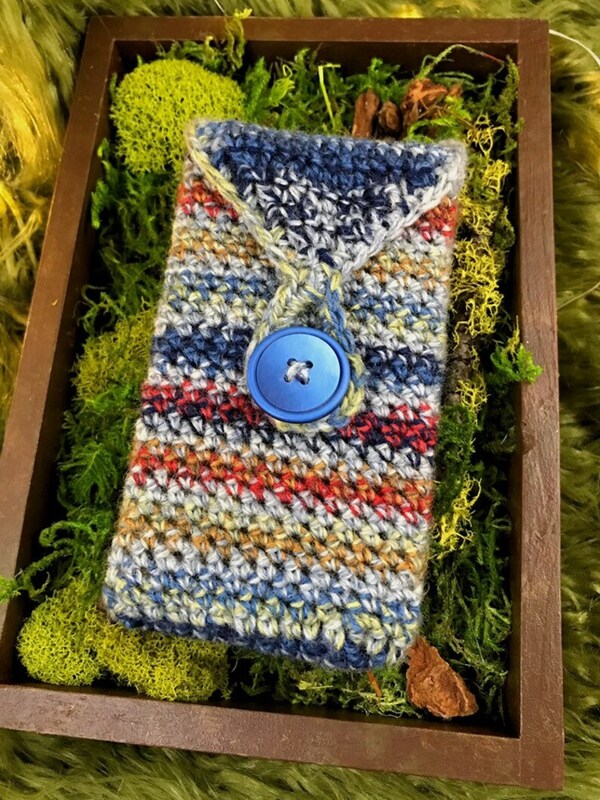 You will ONLY receive the crocheted tarot bag. Please refer to my policies before purchasing this item. We are a pet and smoker free but incense friendly home. If you’re curious about what things are burned in our home please feel free to contact me.